Commander Eric Tufnell RN (1888-1979). Watercolour signed (LR) and inscribed HMS EURYALUS (LL). A pleasant depiction of one of these beautiful light cruisers of the Dido Class, ships that were to earn their keep a hundred times over in some of the fiercest fighting at sea in World War 2, the Mediterranean. Built under the 1937 Emergency Naval estimates (war was clearly loomimg sooner or later; the politicians had once again cut the peacetime Navy to the bone and had, yet again, been caught out), EURYALUS was launched by HM Dockyard Chatham in June 1939. Her fitting out was, as with others of the class, delayed by bottle necks in production of various key items such as 5.25 inch gun turrets, fire control equipment, armour plate and turbines as the armaments and ship engineering industries were forced to expand too rapidly for available resources and construction to manage. The 11 ships of the First Group of the class were 512 feet long overall and mounted ten 5.25 inch dual purpose guns as their main armament (though not all ships carried this outfit at the start) and 62,000 horse power gave them a very handy 32 knots plus at full tilt. 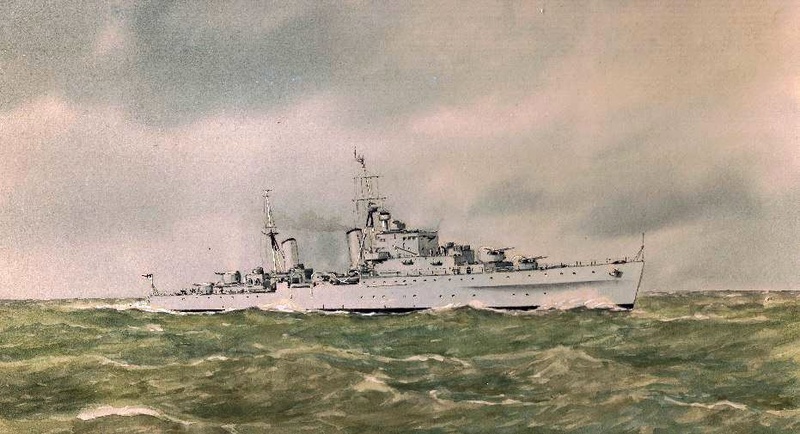 Their slim, graceful hulls and heavily raked twin funnels and tripod masts gave them an elegant, stylish appearance which has been well captured here by Eric Tufnell who depicts the ship after 1943, the year that Q turret was replaced with a lighter calibre, multi-barrelled AA mounting and a growing number of radar and WT aerials started to appear on masts and platforms. After a frantically busy war spent first in the Mediterranean in the early days of the war, in the Far East in 1944-46 and then in the Mediterranean, Persian Gulf and on the South Africa and South Atlantic station in the 1950s, EURYALUS ended her days in 1959 in a Scottish shipbreakers.